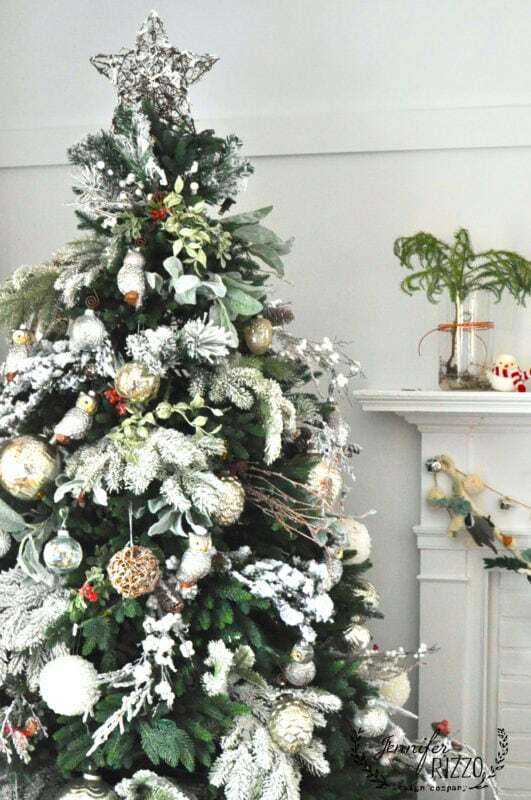 A apart of the holiday farmhouse series, we are sharing our living rooms and/or trees. I am saving my living room for the Holiday housewalk next week (already!, so I thought I would give you a peek at my winter forest Christmas tree. It’s the same tree I’ve had for several years now. It’s a Balsam Hill and I love it! My only complaint is I really would love to have a flocked tree, so I decided to fake my flocking. Instead of voiding my warranty by putting flocking on the branches, I used extra branches from an extra tree and flocked those and tucked them in the branches. re-using an old tree is a great upcycle. In fact, you can see other ways you can re-use an old tree here. 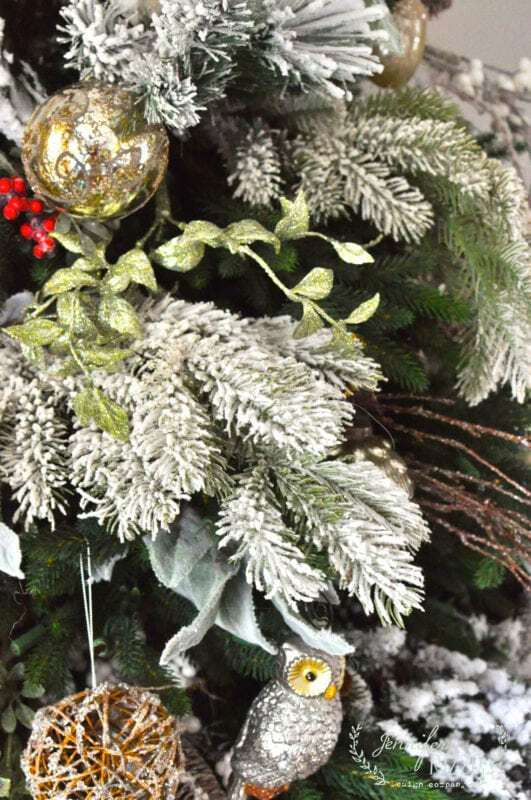 I tucked those branches in among my regular branches, along with some flocked pin cone branches, berries and other sparkly and snowy floral’s. 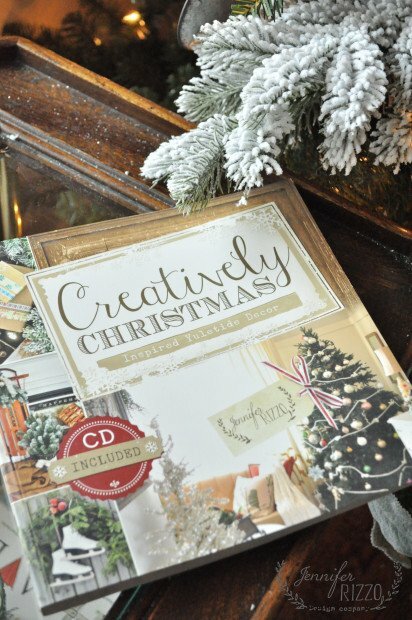 Both big name craft stores have lots of pretty pre-made branches you can use. 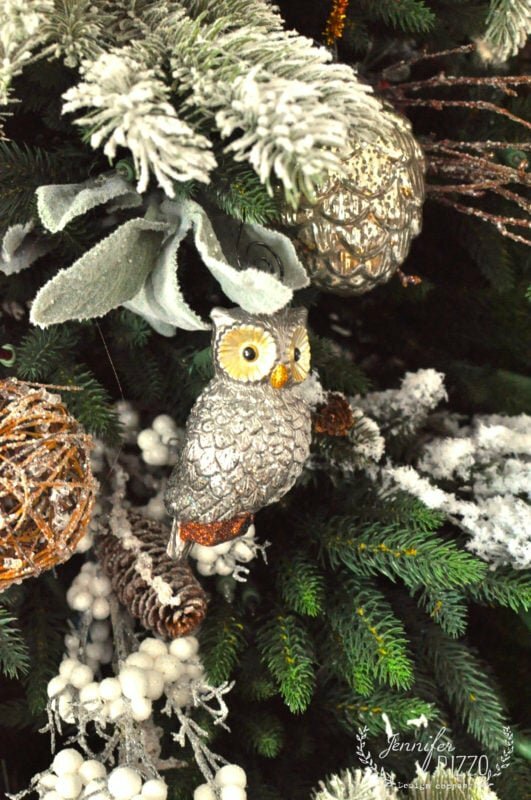 I hung my owl ornaments a well as some mercury glass (love! ), and glittery snow balls. I reused a lot of the items I used last year with my boho Christmas tree. It’s nice to be able to use the same decor over and over in a fresh, new way. And, much cheaper! I do try to come up with some kind of theme every year to give myself a direction to change it up. Before blogging I just put everything on the tree as is. This is my decorative tree. Our tree in our family room has the most important decorations of them all. Everything the kids have made! I love that my tree has two light options. Personally, I am a white lights person. It’s pretty either way. 🙂 It is nice to have the option. I am excited to share my entire living room with you next week. 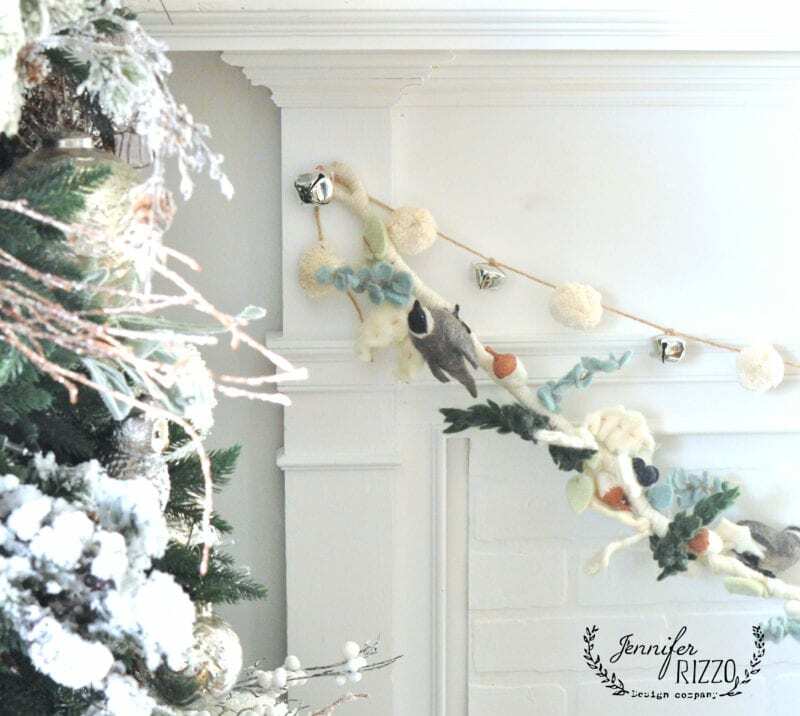 I’ve been decking the halls for a while now.I splurged just a wee bit this holiday season and bought a felted chickadee garland from Anthropologie.I saw it on-line and instantly fell in love with it! It was the only thing new I bought this season with the exception of a few small things from Target and some greenery.Though, after I took the picture I decided I liked it better in the dining room, so it’s now on the hutch. Now that everything in the living room is painted white. I really love how it acts like a canvas for color and pattern. It feels so much more calm and restful in here. I love how my winter forest Christmas tree looks against it! 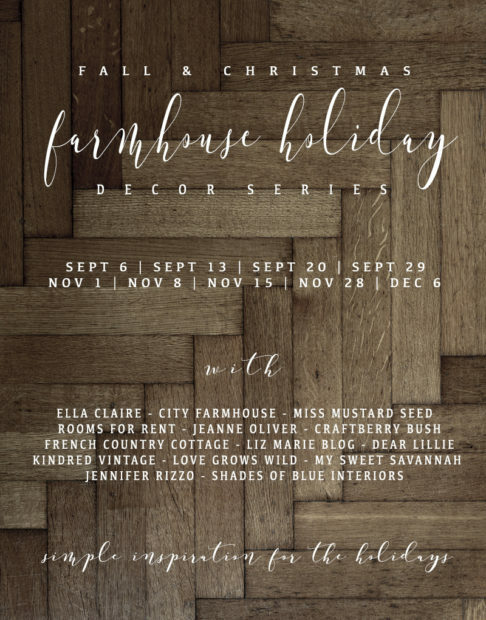 And the other bloggers home in the holiday farmhouse series! So beautiful. Just bought your book and can’t wait to try a few of your ideas. 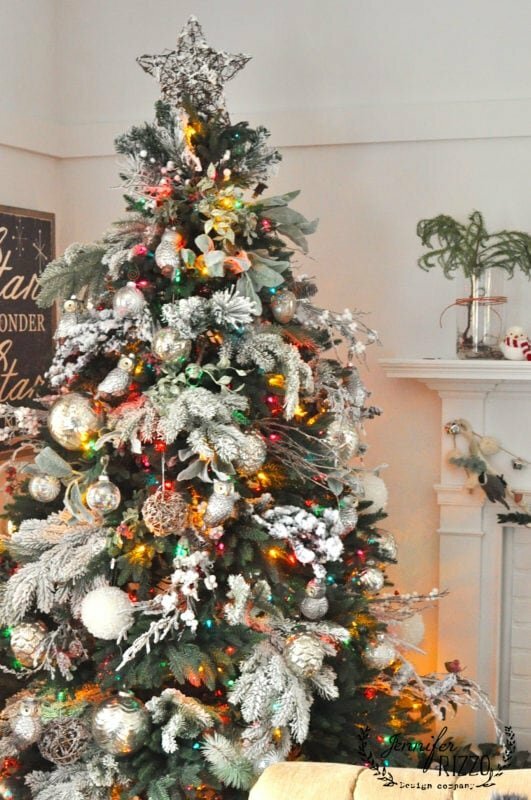 Love your tree…I’d be the one standing there going back and forth between white and color lights…lol. Unfortunately, Balsam.Hill is not in my budget. Would love suggestions on.how to switch up tree decor without having to buy all new “stuff”. I find a few new ornaments just doesn’t do it. Thanks! Gosh! What a beautiful tree. Well done! And I love your tips for a “faked flocked tree”. I actually did the same thing in my dining room this weekend. My tree was just too dark and a few flocked branches mad a HUGE difference. What a great idea. I never thought about taking an old tree and using that for it’s old branches. How genius. Will definitely be doing that. Jennifer your tree is just beautiful! I just got mine done and am getting ready to share it and I hope it comes out as pretty as yours! Thank you Christine! I am sure it’s going to come out beautifully! Beautiful tree! Wondering where you got your star. I actually found it at Michaels! Your tree is impressive. 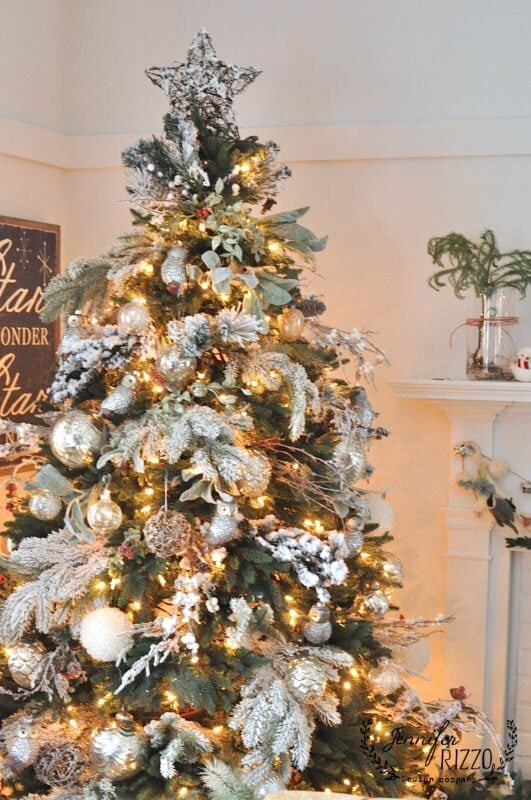 I am trying to choose a Balsam Hill tree (for next year) but it is so hard to choose without seeing it in person. Which one did you choose? Thanks for the flocked branches suggestion. I have had a real tree every year of my life but I have reached the point where I cannot manage it myself, so this is a big decision for me. Have a lovely holiday.